Summary: Did the Battle of Jericho really happen? 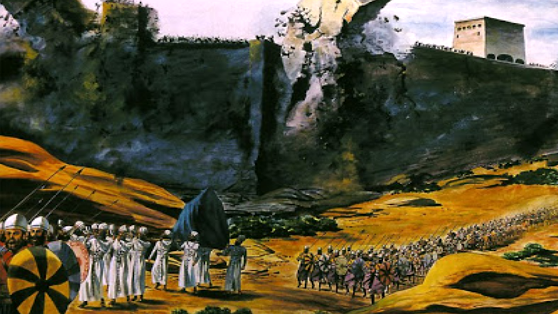 Note: This is the first article in a series on the Battle of Jericho. PREMISE: Jericho was truly destroyed by the Israelites. PURPOSE OF ARTICLE: To present evidence contradicting the biblical record of the fall of Jericho. And the battle of Jericho! Joshua obeys, the walls of the city indeed fall down, and Israel conquers Jericho. But how much of this story is historically valid? All of this, however, fell flat when archeologist Kathleen Kenyon visited the city and performed her own study of it. While Kenyon corroborated the destruction of the city, she concluded that the timeline evidence actually disproved the biblical story of the fall of Jericho. To determine this, Kenyon used the Wheeler-Kenyon method, which focused on stratigraphy – that is, the analysis of layers in the soil. Her dating methods used pottery sherds, city walls, and artifact fragments, as well as construction and abandonment patterns. What she found was that the pottery was almost certainly Early Bronze Age in date. In other words, Jericho (particularly Garstang’s City IV) had been destroyed in 1550 B.C., much earlier than 1400 B.C. as purported by the Bible.4 So the Israelites would have had nothing to destroy in the first place. What are we to do in the face of such compelling evidence against the Bible? Find out in our next article. Warren, Charles. Underground Jerusalem: An Account of Some of the Principal Difficulties Encountered in Its Exploration and the Results Obtained. Place of Publication Not Identified: Nabu, 2010. Print. Sellin, Ernst, and Carl Hans Watzinger. Jericho–Die Ergebnisse Der Ausgrabungen. Osnabruck: Otto Zeller, 1973. Print. Hammerton, John Alexander. Wonders of the Past: A World-wide Survey of the Marvellous Works of Man in Ancient times. Delhi: B.R. Pub., 1985. Print. Kenyon, Kathleen M. Digging up Jericho. London: Ernest Benn, 1957. Print. Dever, William G. Who Were the Early Israelites and Where Did They Come From? Grand Rapids, Mich.: Eerdmans, 2006. Print. Excited for the next one, Vinh! The setup is good. Great summary – this is definitely a controversial issue. Can’t wait for the next article. Thank you so much! I sure will!